iCollections 4.3 – Organize your desktop icons. iCollections is an expertly designed application which helps you keep your desktop organized. The app’s unique features are what make it the most popular method of desktop organization for Mac users. iCollections lets you create areas on your desktop that you can place icons into. This helps you keep related items together so your files (pictures, documents, screenshot, applications, etc.) remain organized. When selecting Photo Frame, a picture frame will be created at the desktop. The Photo Frame will display collection of your pictures as a slide show, eg. a new picture every day. Select your pictures folder and recall wonderful memories. Use View Settings to define a slide show: window design and details to show. You can also create a static picture – just select a picture instead of a folder. Quick and easy! Next story KeyKey 2.7.5 – Typing Tutor. Previous story Script Debugger 7.0.2 – AppleScript authoring environment. Resolutionator 1.1.1 – Allows users to quickly change the resolution of all attached displays. 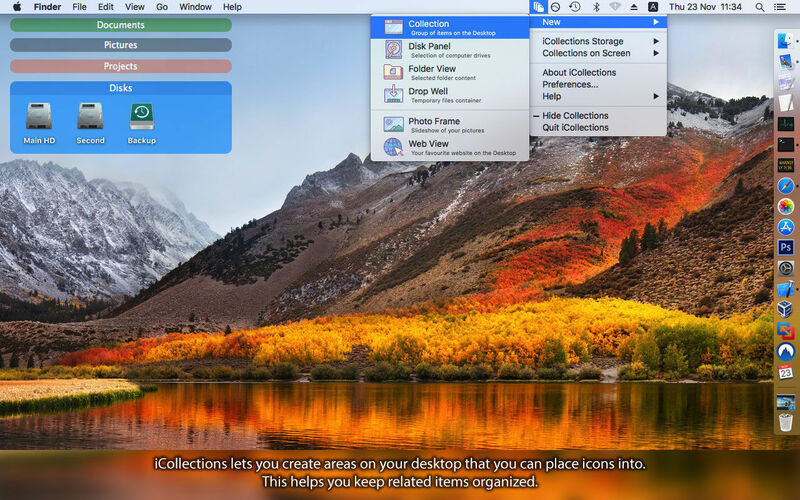 iCollections 4.6 – Organize your desktop icons.